← Too many balls in the air? Sampler Aux Bouquets is complete! I started this sampler at the beginning of September, expecting it to take quite a few months as it’s quite big (90cm long!) 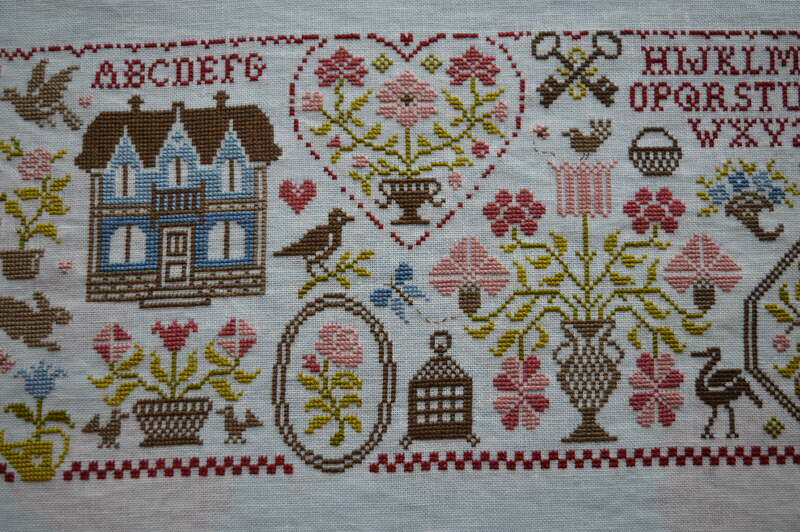 It was this sampler that first drew me to Natalie Cichon’s designs at Jardin Privee, I saw a photo of it on Hilda’s blog and fell for the rich colours. I stitched Nathalie’s bee pincushion and The Way to Happiness sampler first, before embarking on Sampler Aux Bouquets. 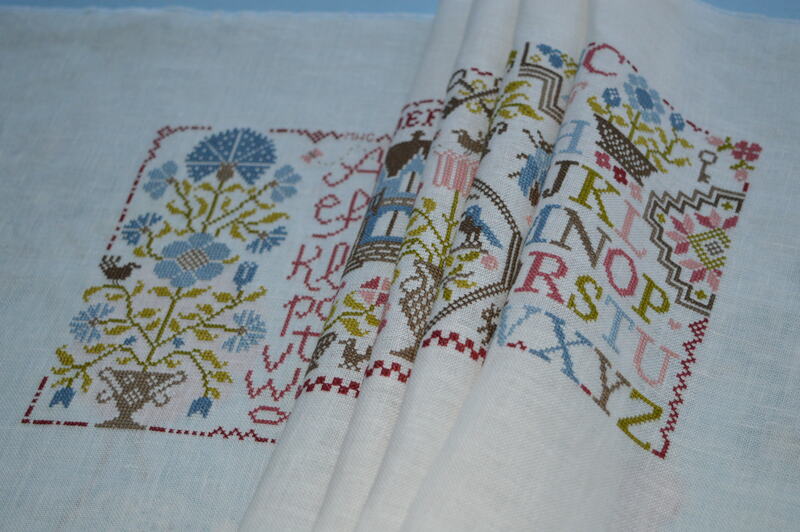 It’s actually three samplers in one, so if you prefer, you can stitch the individual samplers as they are stand alone designs, there are a few adaptations which Natalie provides to make it into one long piece of embroidery. I think all samplers should include the initials of the maker and the year it was finished, both for posterity and also for your own records, I certainly couldn’t date some of the samplers I made 20 to 30 years ago otherwise. I was a bit disappointed to miss the instructions about embroidering your initials in a different shade on the last alphabet as I think that would have been a nice, subtle way of doing it. 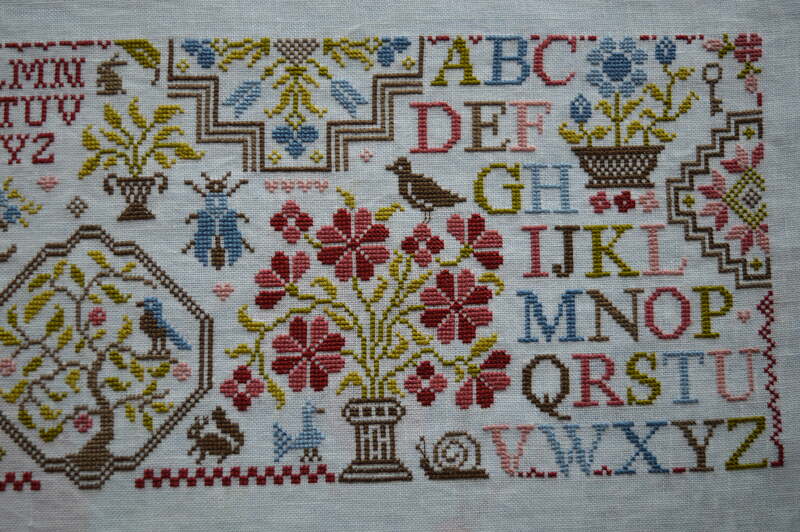 One of the suggestions made by a reader was to embroider it within the border above the alphabet, so thanks Susan for the suggestion, I think it’s worked brilliantly, it’s there but it doesn’t stand out. This entry was posted in Crafts, Serendipity, Sewing and tagged cross-stitch, Jardin Privee, Sampler Aux Bouquets. Bookmark the permalink. 44 Responses to Sampler Aux Bouquets is complete! This is absolutely gorgeous. Lovely work!!! Wonderful !!! Congratulations for finishing this one. I am cross-stitching durind this slow sunday. Have a great week. I’ve enjoyed watching this grow into a finished project. It’s lovely! Thank you Maia, I find it helpful having the record of my progress too, it spurs me on! Your sampler is beautiful. I think you did a fine job photographing it. I love the colors chosen and your workmanship is wonderful. I agree about needlework having initials and a date. Good choice on tossing those domestic chores out the window! Thank you Jill, I don’t need much encouragement to forget the housework! I cannot believe you only started this in September. You are so speedy! I have been watching your progress for weeks on Slow Sunday Stitching and you inspired me to get a new cross stitch project all prepped. I only need to pick up 8 colors of floss as I had the rest in my stash. I can’t wait to see what you work on next! Thanks Tanya, I’m as amazed as you how quickly this has grown, looking forward to seeing your project, I haven’t decided which project to do next! Your piece is fabulous. Congratulations on getting it finished – and so quickly too. Thank you Anne, it grew a lot quicker than I thought it would! 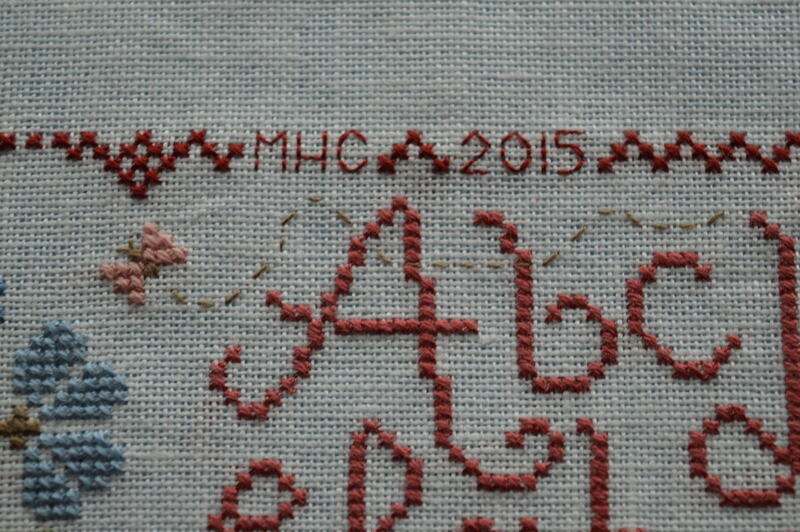 It has been fun watching from the sidelines as you stitched this sampler! It. Looks fabulous! Thanks LeeAnna, I’ve enjoyed stitching it but it was good to finish it too! A lot of pretty stitching on a beautiful design. It will look fantastic framed, hope you will show a photo when hanging. Thanks Sheryl, I’m hoping to post a photo of it framed, might not be hanging though! Your sampler is fabulous, such lovely bright colours! And you stitched it so fast! I love seeing initialling and dating on stitching. It’s always nice to know in what era an item was made! Thank you Barbara, it grew a lot quicker than I anticipated! Congratulations on the finish! 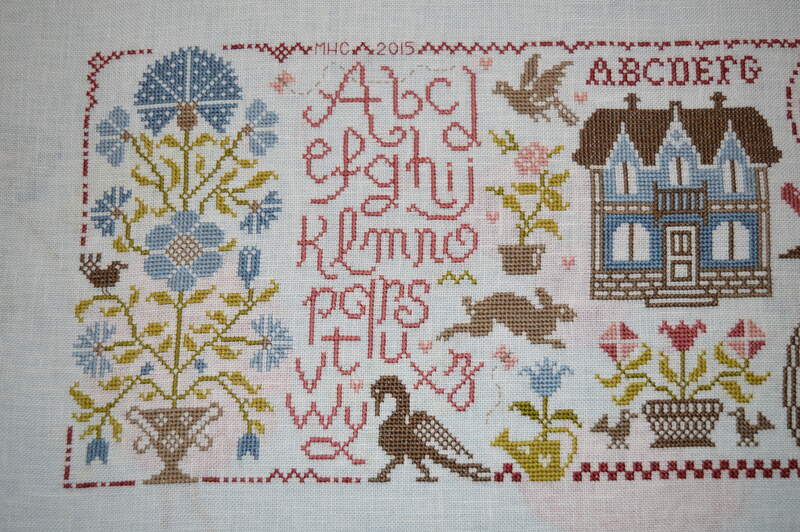 It’s a beautiful sampler, and I love the colors too. Thank you Laura, it was the colours that first drew me to this design. oh, it is beautiful….you have to be so happy with the result! Thanks Cath, I ‘m really pleased with it, got to collect it from the framers now! I have loved seeing this Sampler as it progressed. It’s gorgeous! Thanks so much for linking up to last week’s Stitchery Link Party! Oh my, that is just GORGEOUS! Well done!